BizBuySell.com, the Internet's largest business-for-sale marketplace, reported a record number of businesses changing hands in 2017. Looking into specific industries, the restaurant sector experienced major growth in the second quarter. The number of closed restaurant transactions increased 34 percent year-over-year, and the median sale price jumped from $165,000 to $195,000. Improving financials likely contributed to higher sale prices. The median revenue of restaurants nationwide increased 7 percent year-over-year from $504,500 to $540,000, while cash flows increased 2 percent to $100,000. Despite higher asking prices, sales are closing at a faster pace. In the second quarter, the median days on market stood at 168, marking a 5.6 percent decline year-over-year from 178 days. Franchises are also increasingly seen as desirable acquisition targets. Established operating franchises for sale comprised 7 percent of active listings and 9 percent of closed deals in the second quarter of 2017. In addition, the median sale price of franchise businesses in the second quarter was $232,500, slightly higher than the median $229,000 for all transactions. So what do all these numbers and data points mean to you? Whether you currently own an independent or franchised restaurant…or are considering a move into this arena…NOW IS A GREAT TIME! The combination of increasing revenue, increasing cash flow and fewer days on the market all point to a trend that profitable restaurants and franchises are a solid short and long term investment. In the short term a buyer can be confident of sustainable, and likely increasing, revenue and income. In the long term asset values should grow to protect your initial investment. Buying an existing restaurant, independent or franchised, takes much of the risk and guess work out of the process. With longevity, verifiable financials, and a negotiated lease in place, restaurant buyers/sellers can expect the purchase price to be somewhere between two to three times ODE (Owner Discretionary Earnings). Buying an existing restaurant is safer because you have an existing customer base. By knowing the sales and cash flow, you can determine the cash flow YOU NEED and shop for a restaurant that is currently generating the required earnings. Then you take your experience and motivation to grow it to the next level. If you currently own a restaurant or are thinking about buying one, The Restaurant Brokers at We Sell Restaurants are here to answer your questions and assist. We are the Nation’s largest Restaurant Brokerage Group and pride ourselves on our level of service and results. All conversations as well as our listing strategies are done to protect the confidentiality of our clients. Please contact us at 1-888-814-8226 or click this link to have a Restaurant valuation performed at no cost or obligation. You may be pleasantly surprised to learn what your restaurant is worth. Looking for great quality of life, lower costs and restaurants for sale to support your family? Read this article to understand why your search may need to focus on small towns. The majority of profitable restaurants for sale are located in major urban and suburban areas primarily due to their adjacency to multiple residential and business customers. Keep in mind, however, that the more desirable and “populated” the area, the higher the rent, the greater the competition, and the overall cost of living to reside near your business can quickly offset the benefits of being in a prime spot. The Restaurant Brokers at We Sell Restaurants have many successful and highly profitable restaurants for sale in major cities including but not limited to Atlanta, Charlotte, Fort Lauderdale, Denver, and Austin. We also have equally as profitable restaurants for sale listed in more remote areas, and while they may not be in the center of all the action, they do provide a long list of benefits and advantages. The first and foremost benefit of restaurants for sale in more remote locations, is the cost of living. Owning a home more than an hour outside of a major city or suburb can cost, in many instances, less than half of what some houses would cost in a more populated area. A lower cost of living translates to a better lifestyle with more disposable income. In the Atlanta market, a 3,000 square foot home can run $700,000 within a 15-mile radius of the city reduce to $500,000 within a 30-mile radius and can cost as little as $250,000-$300,000 in a more remote area. Well run restaurants for sale in these areas tend to enjoy longevity and repeat business as a result of the local reputation they’ve built, and the fewer number of establishments serving the area. Rent is another major factor, as it is the single biggest fixed cost on a restaurant profit and loss statement. You can flex how much inventory and supplies you buy and you can manage your staff and wages based on traffic volume, but the rent is the rent. Rents in strong suburban markets such as Gwinnett and Fulton County, Georgia, can range from $25 to $40 per square foot and more. The average rent in these areas for a 2,500 square foot restaurant is around $7,000 per month. However, if you venture out a little further you can find rents as low as $12-$18 per square foot. Lastly, and equally as important is quality of life. The pace is slower in smaller towns, people tend to be friendlier, and everyone knows your name. Living in a smaller town is not for everyone, but if you are looking to acquire a business in a small town, and the charm and appeal of living away from the fast pace, high cost urban scene, please check out our listings of restaurants for sale with We Sell Restaurants. One of our restaurants for sale in small towns is listing #5560 in North Georgia’s White County. Priced at $249,000, this location has been open for over two decades, is doing over $650,000 in sales, and generating around $100,000 in owner benefit. The space is a very manageable 2,200 square feet with another 1,000 square feet of outside seating. Rent is only $3,400 per month including CAMS. Another one of the many restaurants for sale outside of cities is listing 5463, located in Thomasville, Georgia. This established and profitable BBQ business has been open for 10 years and generates $730,000 in sales annually. The current owner is completely absentee, and this popular restaurant is still showing a profit. It is priced to sell at $199,900, and there is a great opportunity for an owner operator to come in and make $80,000 to $100,000 annually. 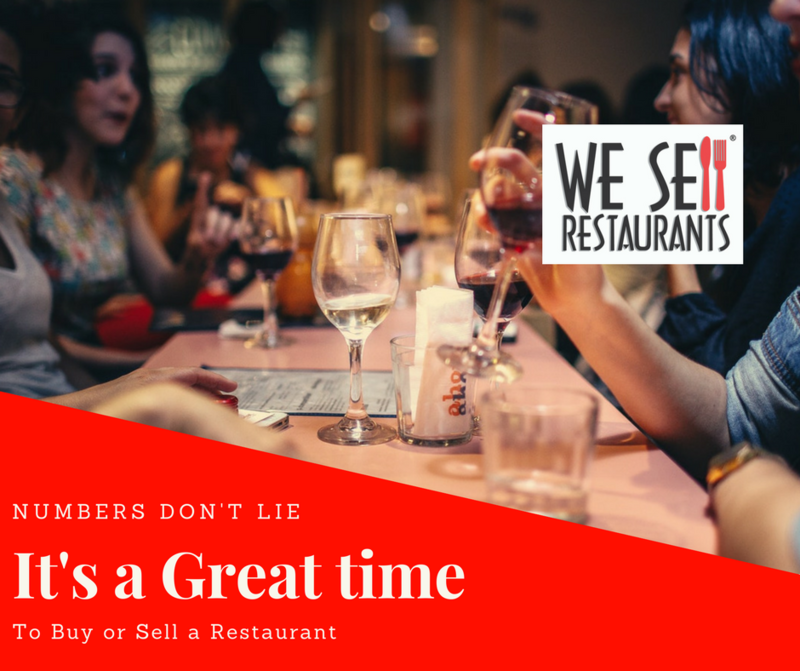 We Sell Restaurants is the nation’s premier source for buying and selling restaurants for sale across the county. If you are looking for restaurants for sale in Manhattan, Boston, or Raleigh, we have plenty of listings to choose from. 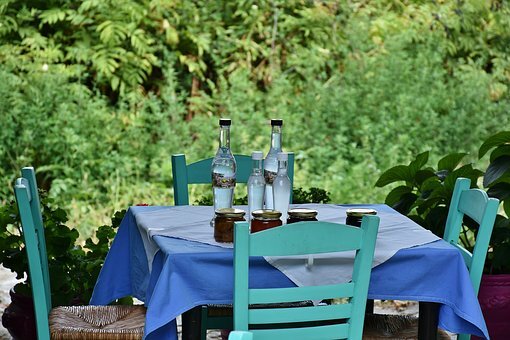 If you’re ready for a slower place, we have restaurants for sale for those of you who are looking to uproot from a major city and go somewhere quieter while still maintaining a certain income level. Check out all our listings on wesellrestaurants.com and call one of our certified restaurant brokers today at 404-800-6700. The Restaurant Brokers at We Sell Restaurants work with hundreds of restaurant owners every year. The number one question we are asked is: “What is my business worth?” This is a math problem and easy enough to solve. What may be less obvious are the other items included in the transaction. Our advice to anyone who is thinking about selling their Franchised or owner-operated restaurant is to make sure all your information is accurate and up-to-date. We’re not just referring to the obvious…the dreaded Profit and Loss statement. Restaurants are primarily valued based on the sales and cash flow they generate. The better and more verifiable the numbers…the greater your ability to maximize the value of your restaurant. That’s only part of the equation however. Many owners focus exclusively on financials and fail to make sure they are up to date and accurate when it goes beyond the numbers. Case in point: leases and equipment lists. Sometimes the line between assets – also known as the FF&E or Furniture, Fixtures, and Equipment and leases are blurred, especially if the landlord owns part of the equipment. Here are a few stories from the Restaurant Broker’s files to give you real life examples of what happens once we bring a buyer to the table. This is AFTER we had a restaurant in contract and past due diligence. In scenario 1, a restaurant owner listed their business for $59,000. He was new to the business, had been open less than a year, but was starting to show some decent sales figures and turning a small profit. An offer of $55,000 was received and agreed to. The transaction progressed through due diligence and then the lease assignment process began. The landlord informed the restaurant broker that he owned all the equipment and was letting the current owner use it. Needless to say the seller should have never included assets he did not own as part of the sale. The Buyer and Seller had to renegotiate the transaction for half of the originally agreed to price. The seller only had goodwill to sell. In scenario 2, a bar owner listed his business for $250,000. He had a great location at a below-market rent. The seller had informed the broker and buyer he had five years left on his lease which was correct, according to the lease document. The value of the furniture, fixtures and equipment combined with the great location and lease rate generated an offer north of $200,000. But when the buyer’s restaurant broker started the lease assignment process, he was informed by the landlord that the seller had failed to exercise his option to renew so he was effectively on a month to month lease. While the buyer was ready to overpay for assets, the landlord saw the opportunity to jack up the rates and the new rent would be 50% higher than what the buyer was expecting. What happened??? Needless to say, the deal went south in a hurry. The take-away here is that when you want to sell your restaurant, get all your ducks in a row. Not just your P&L, which is still the most important part. Go through your lease so you know exactly how much time you have left on it and what the assignment criteria is. Confirm when your option must be exercised if you are anywhere near the end of your initial term. For most landlords, they require that you give written notice anywhere from 90 to 180 days PRIOR to the end of the first term. If you skip this step, your lease is not assignable and there are no rates for the option years. Lastly, when you provide an asset list, make sure it is current and accurate. Don’t list items that are leased (like the dishwasher) or that you don’t own (like the Coke and Tea Machine) or items that are owned the landlord that you did not install. When you get your restaurant under contract, the rubber meets the road. The last thing you want as a seller is for the buyer’s offer to be based on inaccurate information. These details will kill your deal and the opportunity to sell your restaurant. Do you want a review of your lease or equipment list? 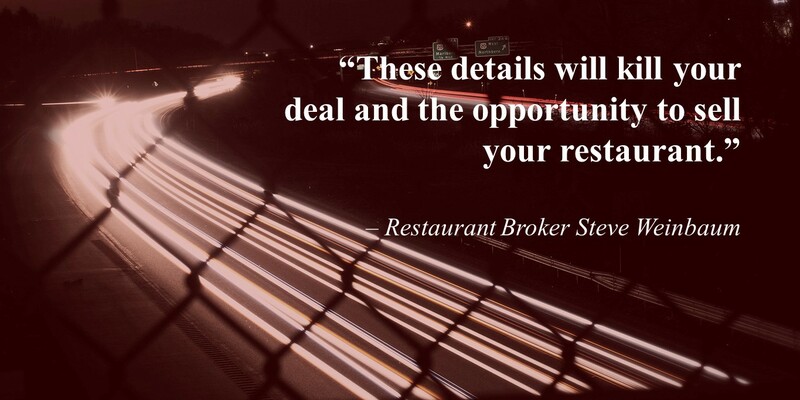 Contact Certified Restaurant Broker Steve Weinbaum for his expert advice on selling a restaurant or check out our restaurant for sale listings online at the link below.